Green Day released their award-winning album American Idiot back in 2004, as a direct response to an American world post 9/11. Using their worldwide popular songs as a platform for the production, with a book by Green Day frontman Billy Joe Armstrong himself, the rock opera aims to display the confusion and pent up frustration towards politics and the media at the start of the century. It explores the explosive emotional consequences with the lives of three characters and the visceral production gives a new context to the successful punk rock album. Whether a fan of Green Day or not, the production is clever to present the direct reaction of anger and rebellion right from the gut. 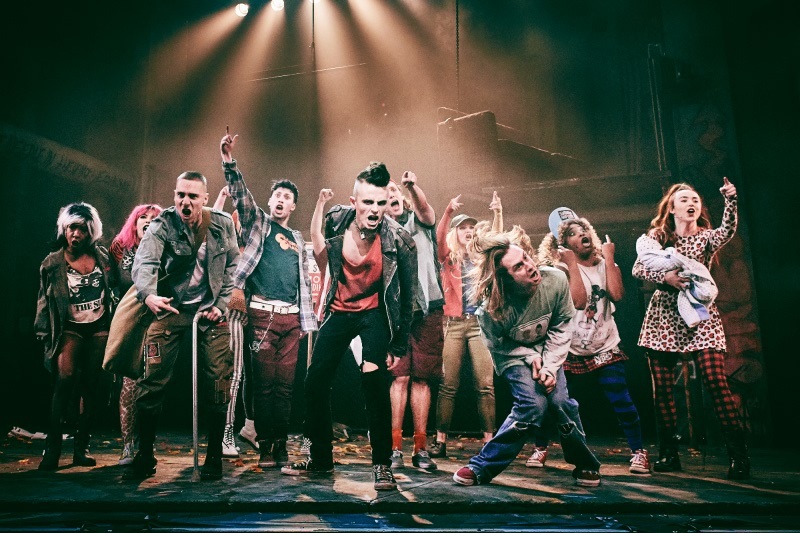 The show starts energetically with the titled song and the first lines ‘Don’t want to be and American Idiot’ are a striking prelude to the themes surrounding the production. The production can definitely be classed as a rock opera. Given the original album’s genre, the stage production mirrors a strong emotional rebellion, which packs a punch, but doesn’t go over the top. The production displays songs from Green Day’s album with added classics from previous albums. The energetic production captures a suppressed anger towards the American government post 9/11, as we see from the backdrop of the politically charged songs. The company perform numbers from the pulsating album with exemplary choreography by Blair Anderson. It’s a great highlight to see the voices of anger and hurt being bought to the forefront. The three central characters Johnny (Tom Milner) Declan (Christian Tyler-Wood) and Theo (Glenn Adamson) seem to have no direction in life and use Green Day’s emphatic songs to display their inner feelings. With a constant stream of media information, the overwhelming cacophony in the character’s minds are prevalent, as their internal emotions become the context to the songs within the production. The meaning behind the songs, and indeed the album itself, are highlighted spectacularly within the rocking production. We watch the rebellious three young men in suburbia trying to find a purpose in a seemingly new world. The play starts on the twelfth of September, 2001, as we see news footage from the time displayed on a television screen overhead. Particular lines of songs become instantly thought provoking, giving scope to think about people’s perception of the American political culture at the time. The trio sing the lines with a touching passion such as ‘In a land of make believe, they don’t believe in me’ and ‘information age of hysteria’. It’s easy to miss these striking statements if the songs were to stand alone, however, when raw emotion is played out right in front of our eyes, we gain a new appreciation for the album itself. Director and choreographer Racky Plews is unafraid to tackle the deeper meanings behind the American Idiot album head on. Just as Green Day make a point to explicitly say how they feel, and Plews makes sure that the darker emotions are also displayed on stage. Themes of depression and loss are tastefully touched upon. The use of drugs is also an explicit motif, its purpose showing the vices used to cope with confusion and not being understood. The musical talent from the company definitely make this show entertaining, especially when Sam Lavery is seen within her role of Whatsername. Lavery takes on the role as the unafraid strong-willed woman with perfect ease and has a wicked voice to suit. The social and political context really takes the production to further heights. 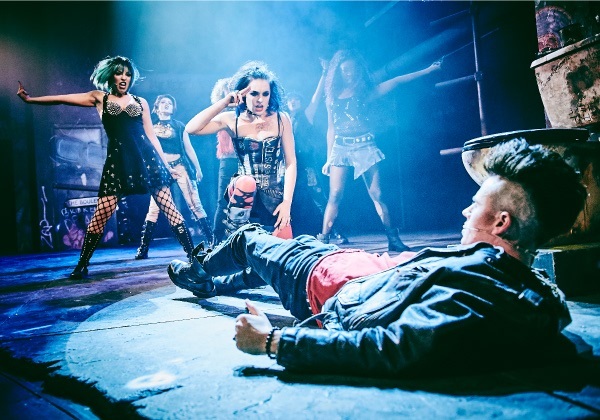 Its clever staging and rebellious story allow the audience to appreciate the ideas behind the reason why the American Idiot album was created in the first place. Plews and the company paint the angsty picture about the inner nuances of what the album really means to say.